To be an extrovert is a whole lot of fun these days! You can create a lovable social image among your friends and acquaintances if you are an extrovert. For someone who is contrastingly an introvert or someone that is closed emotionally, it takes a lot of hard work to understand him or her. 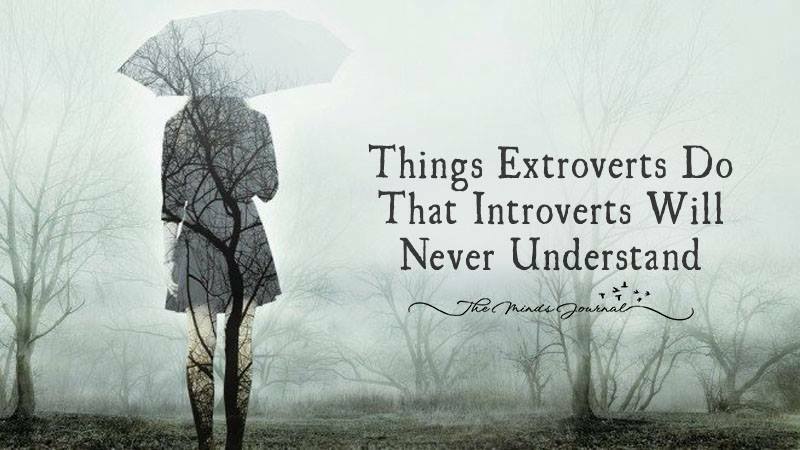 Extroverts often do a whole lot of perplexing things that may or may not hold an answer for their behavior. A lot of extroverts will often share a lot of secrets at work or even among friends. They have a bigger social network where almost all individuals share their deepest and darkest secrets. Introverts will be comparably quite startled at a large social network and will find it very hard to share his or her emotions and feelings on a social plane. A lot of extroverts often move around in packs of two or even multiples. They have a large group and always believe that the more the merry! Although this may be a good thing to believe in, a lot of introverts feel that a large group is not necessarily a good thing. Once in a while travelling and moving about alone is a good thing! Extroverts feel the intense need to share their feelings with people in large numbers. There is an open door policy maintained both at home and outside of it. Most extroverts are people pleasing and believe that more and more people need access to the inner circle on a group of friends. Extroverts often mix with a vast range of people and have attributes that differentiate them from the others all too well. They often incessantly do a lot of things that makes them the center piece of attraction in an event or a party. The social calendar is often packed and there are parties and events that often celebrate the successes of extroverts. Extroverts are always on the lookout for visiting theme parks and expos. They love to do fun things in groups and would like to spend a good amount of time sitting on rides. The average introvert on the other hand finds these theme parks excruciatingly painful. These could in fact be an expensive form of punishment. Jostling crowds and finding a place for one self in a ride is not something we characterize introverts with. Extroverts love eating supersize burgers, pizza and are always on a quest to find a big gala or social bash. They are hungry for exposure and want others to know what they are doing professionally and otherwise. Introverts on the other hand, are not after consuming big. Entertainment and fun moments aside, extroverts often like a big get together that celebrate people and their friendships. Big ticket deals are often made in these parties and extroverts feel a compelling force to attend these in large numbers! My horoscope says that they think they are being straight forward, but they are actually asking me to read between the lines. And sometimes I give off mixed messages that i expect them to understand. The solution for both of us is to actually try to deeply listen to one another. I hate assuming meanings, though.